I have a new favorite side dish you guys! It has so much flavor and is ready in no time at all. It would be perfect for the holidays! Isn't it so festive with the red and green? I love a dish that is equally as pretty as it is delicious. This dish is absolutely bursting with flavor! I love roasted tomatoes (I use them in sauce all the time), but roasting them with garlic just makes them taste even better. 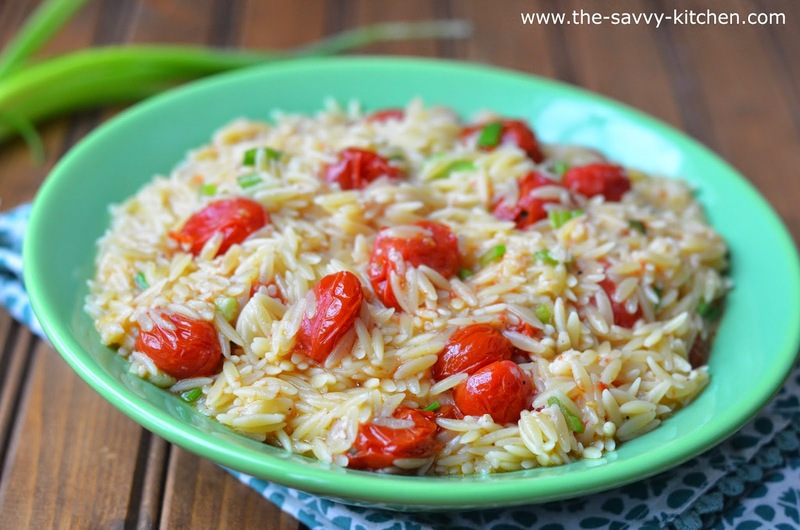 The tomatoes alone make the orzo taste amazing, but the mild flavor of scallions plus the Parmesan make this dish creamy and so decadent. It comes together in 20 minutes and will have everyone's mouth watering. 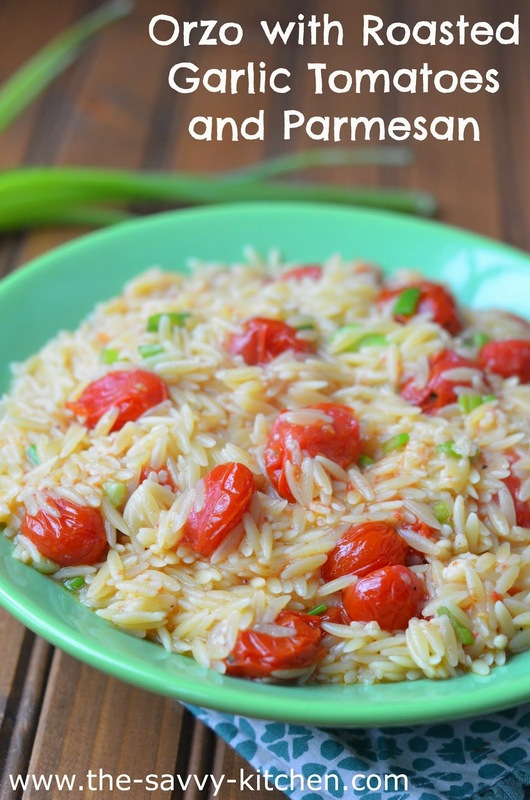 I love love love this easy dish and I'm positive you will, too. Enjoy! In a pie plate, mix the grape tomatoes, olive oil, garlic, salt and pepper. Toss to coat. Put in the oven and cook for 15 minutes, stirring occasionally. Meanwhile, heat the broth in a saucepan. Once boiling, add the orzo and cook according to package directions. 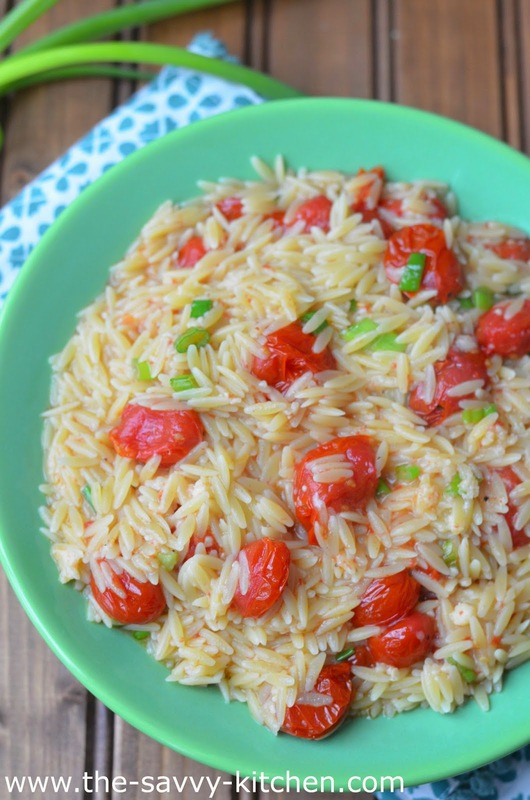 Once done, add the cooked orzo, tomato mixture, scallions and Parmesan in a large bowl and toss to combine. Serve immediately or at room temperature.